Last night I posed a question to my husband: would he like a stir fry or corn dogs for dinner? Obviously not a very fair question. Sorry, stir fry, your time will come. After my husband closed his gaping maw, I got down to work. After a bit of Google-ing, I spotted this near-perfect recipe. I made it more perfect by adding in some chili-powder for flavour and a kick of spicy cayenne for bite. These would be a perfect addition to your Canada Day or July 4th holiday party. The end result isn’t the cylindrical n’ greasy meat-pop of your carnival dreams, but it does satisfy any food-on-stick craving you might be hankering for. These corn dogs are flat at the bottom, but they are crispy and the flavour is just right. I wasn’t sure about adding all that sugar, but it actually helped them taste more authentic. I liked the sweetness but feel free to cut it down or leave it out completely. I had some lollypop sticks leftover from some fall-time caramel apple making and they worked perfectly for this meal. Please note that this recipe makes a lot of batter! So feel free to increase the hot dog amount to 8 if you are feeding a crowd or do like we did and use the leftover batter the next morning to make a really great corn bread. Just fry up a small amount of bacon – or just heat up some vegetable oil or bacon grease in a cast iron pan. When hot, pour in the batter and place in a pre-heated 375F degree oven for 15-20 minutes. Slice into quarters and eat hot. *edit: I’ve reduced the amount of milk by 1/4 cup since many have had problems with the batter being too runny. This should help – the batter should be thick, not runny. Preheat oven to 400F. In a large bowl, combine the first 6 ingredients. In a smaller bowl, mix together the milk, egg and canola oil. Pour the wet into the dry and mix gently with a fork. Cut your hot dogs in half (mini-dogs not skinny-dogs) and pierce each half with a stick. Dredge each half into the cornmeal batter and place onto a silpat-covered cookie sheet. Bake for 15 minutes or until the batter becomes golden brown. OK! I'm game. Gonna give these a try. 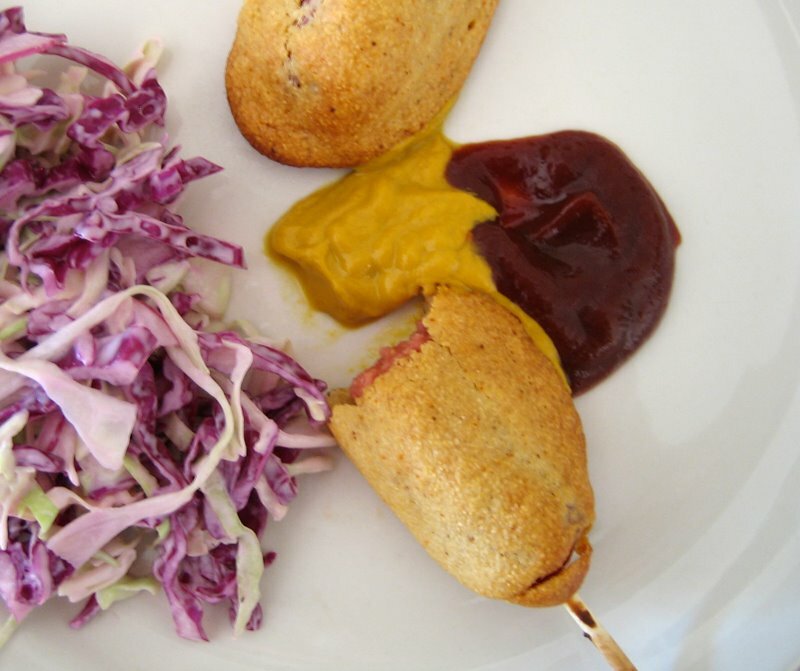 I assume veggie dogs will work…..
i haven't craved a corn dog since a rural country fair corn dog incident last year, but these look so good i must try them! i'm soo hungry now! i'm craving for those. Hm, I wonder if corn dogs are still corn dogs if I make them without sticks?? I have a pkg of hotdogs in the freezer, and these sound like some summer fun! What a great idea! I don't like hot dogs but I bet I could use some chicken sausage. I'm having some serious dinner envy!!! Wow – I'm definitely going to try this recipe. I love corn dogs but hate deep frying! no way!!! baked corn dogs!! I am so on this!!! you rock! woohoo! Baked, and mini-sized, and a tofu option! Love it. Jessica, I will say yes to no sticks! They would still be awesome. Kntgirl, veggie dogs will be fine. A country fair corn dog incident? Randi, do tell! Karencilla, they are so good. Thanks dairyfreecook, a great recipe! Joanne, yes, feel free to use any kind of sausage/hot dog that you prefer. Su-Lin, I'm not a deep-fryer, so these were perfect. Thanks Stephchows, these were so great! Kali, I hope your husband (and you) loves these! Those look so fun, and probably tasty too! What we also need is the recipe for the slaw salad alos pictured. If I posed that question to my family, I'd get the same answer. I would be my son's favorite person for a year if I made these. I can't believe they aren't fried! They look fried, in that good sort of way. How fun! I've always loved corn dogs (though it's probably just the idea of corn dogs I love). There are some vegetarian store bought ones out there but this is awesome (or dangerous) – now I can make my own at home! I'm making these today, for two reasons. First, they look too good to be true. Second, it's Canada Day, and these surely fit the fun/celebratory bill! Heck Yeah! I am absolutely making these! My kids will have fun doing this with me! Thanks for sharing the recipe! I can't wait! This is SO cool. My boyfriend would go bananas for these so I might just have to do them one night for a 'treat' dinner. Oh, I would call them 'pogos', though. Thanks for the wonderful recipes you provide, I'd made several and they're always delish! Thanks, by the way, for being so cool to include vegan alternatives in your recipes. I love that about your blog… that and the photography. Always so pretty! Stir fry doesn't stand a chance against corn dogs. And these look amazing! Hag, the slaw was pretty simple really, but it wasn't awesome (though Cornelius would disagree, he loved it, i thought it was just okay). Leftoverist, these are perfect and so not fried. It's a good thing. eatme, you now have no excuse for buying them from the store! Tara, I agree on both counts. Hope you enjoyed them! Happy Canada Day!! Fueled by plants, what?? Homemade corn dogs aren't healthy?? 😉 Thanks! Sarena, I'm sure you and your kids will be pretty pleased with the results. Thanks so much, Molly! I hope you and your family love them as much as we did. Once again I wasn't disappointed!! These are PERFECT! Mine would have been had I remembered the salt and cut back on the milk(I'm a notorious non-measurer) a bit. They cooked up crispy and oh, so delish, they just looked like little maxi pads with "wings".LOL Oh well, we'll definitely put these in our rotation of easy kid-friendly meals! Ahh, homemade corndogs never even occurred to me! my friend made these for our Canada day picnic and they turned out really well! yummy! she used veggie dogs…but I bet they would be even better with a european weiner or something like that! what a great recipe for a lighter alternative! Sorry but I have to say, this was an awful recipe. It came out flat, tasteless, and the only thing that came through was the chili powder, which seemed out of place for a corn dog. Haha, love the maxi with wings comment, ~Molly~! True!! Glad you enjoyed them. Well Laura, now you have the idea, so get making them! Hag, glad you liked them. I think they're pretty tasty too! Oh well, anon, at least you tried! I liked them a whole lot, sorry you didn't like them. Aww, they are precious! And they sound (and look) delicious. these look so fun and tasty! i'm going to try this…. I love this! Food-on-a-stick cravings — so true!! They are in the oven as we speak…the batter is kind of runny, but I am hopeful that they will turn out(as is my 3 1/2 year old daughter). The crust was good, but they looked like flat cookies with a hot dog on top. I guess next time I'll try with less milk. Very tasty and worthy of a second try. My daughter had a great time helping me. Thanks! Kate, do try them & let me know what you think! Figtree, I think these would be a hit in any house! I'm glad I'm not the only one, Cookiepie with food-on-stick cravings! Anon, hmmm, I didn't find the batter that runny, more gloopy. Glad you found them tasty and yes, do give them another try! Um, this is amazing. Do I need to get a silpat? I imagine they're a bit of a pain to clean and get un-greasy. OMGG>>> my nephews and nieces will love these. thanks! maggie, you don't need a silpat (though I love mine and have had it for years!). You can just lightly oil a cookie sheet and you should be fine. Anon, you can't post photos in comments, but I did check your photo. Indeed, super runny. I'd try less liquid. For my batter it was gloopy and thick, so try for reaching a thick-ish consistency that still makes it easy to dip the dogs into! I want to make these right now! These went over super well at our weekly picnic potluck in the park. Kelly, I hope you tried them. Donna, I'm so glad to hear it! Just wanted to let you know we tried these again with less milk(or more flour) and they worked much better!! I didn't measure either time, just added til it was thicker than pancakes but thinner than biscuits. I also cut the hot dogs into 4 pieces each and left out the sticks. They were yum!! Sounds good…my daughter and I want to try this recipe! My guests loved these, insisting that I eat the last one – which I did. Like others, mine came out looking like the snake that ate an elephant in “The Little Prince.” Seems inevitable that the batter will pool around the base of the dog if you’re not frying. Also, I tried cornstarch rolling as suggested by “Fran” but that just formed a slippery barrier for the batter. Maybe I’ll try less liquid in the batter next time, and maybe an egg wash for the dogs. Incidentally, ELS could use a “print recipe” button, because “Print Selected” doesn’t seem to work well with your recipes. I don’t know how hard “print recipe” would be to implement, but it would save readers the pain of having to copy/paste into Word, then print. Robert, the print feature will come with a new design – it’s always on the back burner! But it will get done soon-ish. Glad you liked the rolls, and I’ve reduced the amount of milk in the recipe which should help things. 🙁 so sad everyone else made good baked mini corn dogs. mine were awful and they took forever to prepare.